Researched and written by Thomas Graham, former Executive Officer. The Cook's Galley was a mobile kitchen used to prepared food to feed the chaff cutting team owned and run by the Fife family during the 1930s and 1940s. Jim McGilvray (carpenter) and Harold Fife made it from recycled materials in 1934. It consists of a carriage of four steel wheels with a drawbar for towing. The drawbar was attached to the back of a Foden or McClaren traction engine. On top of the carriage a rectangular cabin was fitted with two single full-length doors and a small window at one end. The kitchen contains a coal stove for cooking, wooden cupboard for storage (below) and food preparation (above). Elsewhere in the kitchen are a number of wooden packing cases, food bins, cooking and eating utensils, fire tools and pitching forks. The origins of this particular branch of the Fife family go back to William Fife (1802 - 1880) who lived on a moderate 12 ½ acre farm at Drumcullion, County Fermanagh, Ireland. All five surviving children of his first marriage to wife Bessie (nee Nixon 1807 - 1850) immigrated to New South Wales, Australia between 1859 and 1865. The aftermath of the potato famine, the death of their mother, their father remarrying and better prospects in an overseas colony were all contributing factors to them leaving Ireland. The Keenan family, their neighbours in Ireland, had a daughter in Goulburn, New South Wales, who agreed to sponsor the new migrants - Faithy (1836 - 1903), Nixon (1840 - 1916), John (1838 - 1874), George (1848 - 1916) and Eliza (1846 - 1939(. Their ages on arrival were 23, 19, 24, 14 and 19 respectively. Harold's Great Grandfather, Nixon started work as a yardman in a hotel, then became a carrier driving a bullock team between Sydney and Cooma. Later he bought and worked land in the vcinity of Goulburn. He married Elizabeth Cole (1849 - 1879) in 1870 who bore him six children. Harold's Grandfather, William (1871 - 1956), the eldest son of Nixon, was the first of the family to operate a chaff cutting business. 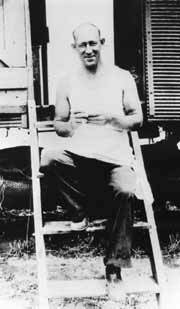 He also bred horses, worked as a railway line contractor during lean times, and a farmer in later life. He suffered the unfortunate accident of having his left foot crushed by the Buffalo Pits Traction engine which drove his chaff cutting plant. He married Mary Jane Whittaker (1874 - 1904) in 1896 and they had two sons William Clyde (1897 - 1971) and James Nixon (1898 - 1972), Harold's father and uncle respectively who played a major role in the family's chaff cutting, produce store and bakery businesses in Wagga Wagga. It was while working on his fathers (Williams Snr) chaff cutting plant in Sherwin's Flat, Tarago, that Harold's father met his future wife, and Harold's mother, Myrtle Wyatt. In about 1919 Harold's father, William Clyde, moved to Wagga Wagga to work for Les Howard who operated a chaff cutting plant. (Les Howard also originated from Goulburn). He was paid one shilling per ton and had an average weekly wage of 2 pounds 8 shillings. James Nixon (1898 - 1972) Williams younger brother and Harold's uncle, joined him. Initially they camped in the Jockey's Room at the pony racecourse where Norton Street is now located and on the site which in years to come would house their Chaff Mill and Bulk Store. Harold and his mother joined his father and uncle in Wagga and with good prospects in the chaff industry persuaded their Uncle Tom, who lived in Goulburn, to purchase Les Howard's chaff cutting plant. For a number of years they worked for Uncle Tom before buying the plant from him and establishing Fife Bros in 1925. Tom Fife still lived in Goulburn so the sale to his nephews suited him. For almost three decades the family business travelled rural New South Wales cutting hay under contract to James Dunn Ltd., Stockman and Leinig & Co., Kerridge & McMahon Ltd., and F.D.McMahon & Co.
Chaff cutting at the time was a huge industry as motor trucks were only starting to become widespead and there were big markets for chaff in Sydney, in the coal fields of New South Wales and Roma Street, Brisbane. In these centres household deliveries were still done by horse drawn vehicles and as the mines were not fully mechanised pit ponies were still in use. With increasing prosperity the family bought their first of three Cliff and Bunting chaff cutters in 1927 and featured it at the Wagga Wagga Show. Their first vehicle was a Model T Ford which Clyde used in the evenings, after completing his daily stint on the plant, to travel between plants to deliver spare parts, bags, provisions and meat. A Chevrolet Utility was purchased from Minty's Dealership, Wagga Wagga in 1927. Crop failures, labour strikes and the depression brought difficult times and the chaff cutting plant stood in the backyard of the family's No.9 Shaw Street home for many years. During these tough times Harold's father took labouring work on the roads with the Wagga Wagga Municipal Council and as a fettler with the New South Wales Railways. His mother collected the fat from the Galley and made it into soap and also sold it to the soap works in town to earn much needed income. Around 1940 the brothers purchased the Swan Bakery and soon owned and operated four shops drawing on the labour of various family members. Irene Wealand, Harold's aunt, remembers his mother making attractive and warm Wagga Rugs from chaff bags for the household beds. The chaff bags were opened and filled with old woollen garments, sandwiched together sewn together and then covered with a heavy patterned material. In 1949 the brothers dissolved their business partnership. Harold and his father held onto the chaff cutting plant and the produce store, which had been established in 1945, at 45 Baylis Street, while his uncle (James) took over the two bakehouses and four retail outlets and formed J.N.Fife and Sons with his boys Ken and Edgar (Ned). The business was expanded with new partners and later known as the Riverina Baking Co. A large bakehouse was built in Edward Street behind the Wagga Flour Mill. A chaff mill was established at The Rock in 1945. This was a result of criticism levelled at the chaff cutters whose machinery due to their heavy steel wheels damaged the roads. A second mill was established at a site in Norton Street which lasted for about five years as difficulties were still experienced with transporting hay from the farms to the mill the authorities been particularly strict on over wide loading. The focus of the business shifted to the produce store and fertiliser. At the age of thirteen Harold joined his father in the chaff cutting plant. In his father's words, "If he won't go to school, he might as well go to work!" Harold started as a lunch boy and by his fourteenth birthday had moved to the chaff cutter been taught the ropes by the older men. At the age of eighteen (1937) a second plant was purchased and Harold put in charge. The plant was in Blayney when news of the outbreak of the Second World War was made known. Harold enlisted and served for 3 ½ years. In 1944 he was discharged under the Manpower Act and returned to the cutter. In later years he followed in the footsteps of his father and became a City Councillor and a Deputy Mayor of Wagga Wagga both serving for a period of 21 years. Harold's younger brother Wallace Clyde (1929 - ) went into politics and became the Federal Minister for Farrer (which included Wagga Wagga). Harold's uncle, James, was badly burnt, in 1939, when the steam box exploded he was working on. Painted with Gentian Violet he spent many weeks recuperating at home. Chaff, as petrol is today, was a much-needed fuel when the horse was the primary source of power and transport on Riverina farms between the late 19th century and the end of Second World War. Horse numbers reached their peak in 1919 when there were 2 ½ million in Australia - 1 horse for every 2 head of population. Over the next three decades the tractor gradually replaced them. To maintain their health and strength working horses needed to be fed three times per day. The most convenient form of fed was to cut hay into chaff and then mix it with other grains such as oats. One horse consumed about 5 tons of feed per year. As a result most farmers kept a proportion of their crops for feed which would amount to 80 tons per annum if they had two 8-horse teams. Others are known to have cut more than 200 tons a year. Chaff was also stocked piled for periods of drought and used to feed cattle and sheep as well as horses. Additional demands for chaff came from teamsters and townspeople that used horses for transport. 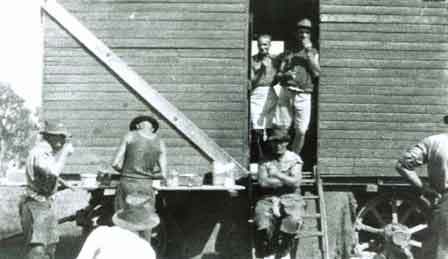 As a result of these demands for horse feed chaff cutting became a profitable business with a number of firms, of which the Fife brothers were one, operating in the Riverina. The hay season usually stretched from early November until the end of January the following year. With the use of 5, 6 or 8 foot Binders, pulled by three horses, the hay was cut, tied into sheaves, and bundles of about ten sheaves, tied together to form a stook and left to dry. The stooks were then collected and carted to a site for the building of a haystack. Linked together in this order they formed a train which moved from one farm to another around the district. On arriving at a farm the plant was set up next to the haystack(s). The farmer had to supply the wood and water for the steam traction engine which had a capacity of 300 gallons. Up to four Furphy carts of water were used per day. The ratio of wood needed per ton of chaff cut was 100 c.w.t of wood for one tonne of chaff. The wood was cut to 2'9" lengths for feeding into the furnace. Stackmen, armed with pitching forks, passed the sheaves to a man at the steam box who cut the twine holding them together and feed the loose hay, with the help of a conveying mechanism, through the steam box 30' long and 22"wide. Steaming the hay before it was cut prevented it from breaking and greatly improved its quality. The steam was supplied from the steam engine through a ¾" pipe. When the hay reached the Chaff Cutter is was fed through a pair and rollers and cut. The cut hay fell onto a type of sieve, called a riddle board, which fed it onto an elevator taking it to a double chute of bagging cylinders. Long pieces of uncut hay fell onto a caving elevator which took it back through the cutters. There were two bag sewers who in turn filled and sewed alternate bags. The machine would cut 1 or 2 bags of chaff per minute which after been sewn up were loaded straight onto a truck which depending on its size was allowed to carry 152, 184 or 220 bags. The blades of the cutter had to be sharpened or replaced at regular intervals and Harold prides himself at been able to change and set 6 knives within three minutes. 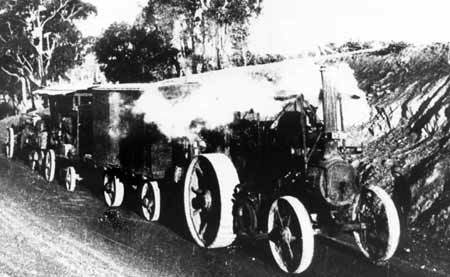 The Traction engine supplied the steam box with steam as well as the power for driving the cutter. The pulley belt turning the drive wheels was 100' long and 6" wide and made of a compound of two or three ply leather sewn together with copper rivets. It cost 100 pounds (a pound a foot). It also generated a considerable amount of static electricity which made ones hair stand upright if you stood beneath it. The dobbin was either a three wheel or four-wheel cart used to carry new bags, tarpaulins, sleeping equipment and spare parts. A horse drawn Furphy Cart was used to bring dam water to the engine for steaming purposes. Drinking water and water used for cooking was stored in a 100-gallon tank and two 44-gallon drums were brought separately to the Galley by Clyde Fife. The tank and drums were placed at the back of the Galley. Time spent on a farm varied from as short as a day to a week. On average the plant cut 40 tons a day but they could reach 60 ton if pushed to the limit. The normal routine was an eleven hour day, starting at 7:00am, stopping for a short smoke break at 9:00am, dinner between 12 noon and 1:00pm, a ten minute tea break at 3:00pm and calling it a day around 6:00pm. The business operated for all but two weeks in the year and in good times the Fife family owned and operated two plants. The routine of the Cook was as follows: The wood stove was fired at 5:45am for a 6:30am breakfast to facilitate a 7:00am start. Because of the heavy labour involved breakfast consisted of one pound of sausage per man with toast and tea. Dinner consisted of roast meat, potatoes, carrots, parsnips and turnips with a sweet to end. The evening meal was usually cold meats and salads. Scones, jam tarts and biscuits were served during the mid-morning and mid-afternoon breaks. Tea appeared at all meals. When the chaff cutting plant was in full production sixteen men were fed from the Galley. When out in the field provisions were usually delivered on a Monday supplemented with fresh bread and meat on a Wednesday due to the absence of refrigeration. Hammocks for the Cook and Engine Driver were strung beneath the Galley (chains still present) while the rest of the men made makeshift mattresses from bales of hay. Wagga Rugs were the principal source of warmth. The Fife family employed a number of cooks with Harold and his cousin, Ken acting as standbye in case of an emergency. Those remembered include Harry Larkin, Horey Baxter and Frank Matthews. Harold tells the story of the time when one of the cooks accidentally cut off his finger which was kept for a while by Geoff Miller, one of the Bag Sewers. When Geoff was asked what he was going to do with it he replied, "Its good to pick me nose with!" Harold also remembers another cook who threw his swag into the Murrumbidgee River after winning 50 pounds on the horses. The Cook's Galley, as part of the Fife family chaff cutting plant, is significant to the history of wheat farming in the Riverina as it represents a certain stage in the horse-based development of rural technology prevalent between 1880s and 1940s. It also has significance for its associations with the Fife family who as the great grandchildren and grandchildren of Irish migrants contributed to the rural economy and political life of the Riverina. With the rest of the chaff cutting plant having either disintegrated (cutter, dobbin and steam box) or been relocated elsewhere in Australia (Traction engine is at Lake Goldsmith, Victoria), the Cook's Galley remains a tangible example of the Fife chaff cutting business and about the men who worked the machines on a number of farms in rural New South Wales. Chaff cutting provided fuel for horses which were the principle form of power and transport on farms during the late 19th and early 20th Centuries. They pulled the drays, wagons or a variety implements for the sowing, harvesting or transporting of wheat. In addition, there was a large chaff market in the major metropolitan areas where horse drawn vehicles were still used and on the mines were pit ponies were employed as labour. With the entry and gradual acceptance of new technology ie the hay baler and the tractor the need for chaff and chaff cutters gradually disappeared. Liquid petroleum became the new indispensable fuel for tractors and trucks and self-propelled auto-binders replaced the Binders of the past.